Hey, hey, hey . . . I do! Actually on this forum their are a lot of people that use them for more than just running their MJ. And I should have known better than to make such a black and white statement - it was almost a "Troll" though it was not meant to be. Well, the link is correct in your signature, so I guess it doesn't matter if it is misspelled in your message. HI all, i don't know if i'm posting int he right place... I was reading all this post and i find the way to fix my fist problem that was that everytime i connected my MJ to the thin client i was getting a blue screen so i change the usb host drive to the standar now i have no problem.. BUT!!! now i have find out that yesterday and today when i pick up my phone there was no dial tone.. so i have to remove the MJ from the TC and rebote it and put back the MJ to the TC and i start working again... what do i need to do to make the MJ stop crashing or shitting down??? ah! when i try to start the MJ with out removing it and doing a restart, its tell me that i don't have the MJ connected!!! can anyone help me out in here?/? i have a TC 5710 1Ghz 512/512 i have remove the unessesarie app and guess i fallow all the instructions!! Did you go into the device manager and disallow power management for each USB Root Hub you have and your network card also. It is under power management when you do a properties on the items I mentioned. What could be happening is thru the night, whenever, the devices sit idle long enough that the OS shuts them down to save power, your MagicJack does not like that and will throw a hissy over it. Give it a try it only takes a couple of minutes. PS - I do believe you have coined a new MagicJack technical term "Shitting Down". It has a familiar ring to it, I like it. Posted: Wed Mar 25, 2009 4:24 pm Post subject: TC is the Answer! Bought an HP t5710 512/512 from a seller on ebay that was preconfigured for magicJack. Got it today, plugged it in to the wall and the gateway, stuck the magicJack on the back and instant service. Did not have to hassle with anything to get it running. The seller includes TeamViewer on the system, so all I had to do was load TV on my desktop. Works like a champ! Paid more that just buying an HP t5710 and doing my own configuration, but it was cheap enough (less than half the cost of an Ooma device,) and it sure was easy. Seller still has three for sale at the same price. Would be glad to direct you to him. Posted: Sat May 16, 2009 10:13 am Post subject: Re: TC is the Answer! I did mine myself. I only have $80 in the way it sits with a 1gb/512. I use it for an internet terminal as well as hosting the MJ. Posted: Sat May 16, 2009 10:47 am Post subject: Re: TC is the Answer! With an 800Mhz processor and 512/512, the TC is too slow for anything other than MJ. Still happy with it. Posted: Sat May 16, 2009 2:03 pm Post subject: Re: TC is the Answer! [I did mine myself. I only have $80 in the way it sits with a 1gb/512. I use it for an internet terminal as well as hosting the MJ. Man, (pun intended I see remarks like this all the time. Would you please tell us how you did it so cheaply? Typical: Thin Client 5710 $80, 1 GB Flash $20 and DDR 512 $30 bucks. In my ordinary calculator that comes up to $130 + $15 shipping. I am in no way suggesting you didn't acquire yours for $80 dollars but you had to leave something out of the story. i.e. you had some ram laying around, a friend gave you the flash - you know, just some little detail you let out of "it only cost me $80 dollars to get it going". When I was buying, configuring and updating memory and then re-selling them, I could have pulled it of if my cost had been only $80 dollars and then re-sell them I would not have been able to keep up with the demand. How ever the demand was not there because my price was by necessity $30 more than my cost which was $100 dollars for the unit (unit + shipping) and $50 dollars for memory to take it to 512/512 (and to this day I would still recommend 1GB/1GB for overall performance [MHO]). There were only a few people that either because of lack of experience with thin clients or just to save them selves having to deal with modifying the units picked up on mine. I passed the (cough) business off to my daughter because she has a lot more patience than I do with only selling a unit now and then and I just help her by providing technical support to her customers. PS - most of my comments were based the T5710, I did convert T5700 thru T5730 models. Some folks just like myself like having the "Top Draw" Thin Clients even though for MJ it is "Way Overkill". Posted: Sat May 16, 2009 3:48 pm Post subject: Re: TC is the Answer! I bought my TC (HP 5710 800 MHz) with 512/512 magicJack ready (just "plug and play") with Team Viewer installed for $109.99 + $10.00 shipping. There is one now on ebay for $59.95 and one for $79.99. Granted, they are 256/256, but they will work, and can be upgraded later to 1GB/512 or whatever the user wants. I agree with you, that it's way cheap, and it doesn't come along very often. 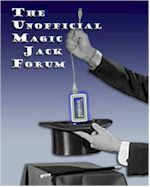 Your cost is much closer to reality for creating a TC for the magicJack. Either way, it's still dirt cheap for phone service even with the extra hardware. As I said before, I'll put up with the less than stellar service for the cost of the thing (even factoring in the cost of a TC - it's cheaper than ooma.) Yes, there are glitches, but a re-boot of the TC and the gateway, or re-dialling the call usually solve the issue. Posted: Sat May 16, 2009 8:25 pm Post subject: Re: TC is the Answer! t5700 256/256 was $33.99 shipped w/ buy-it-now. $25 for the 1gb flash and less than $25 for the 512mb RAM. I'm going to drop another $50 into it for an expansion module and VGA because I use it for my primary internet appliance now. I don't even fire up my tower any more. Posted: Sun May 17, 2009 3:43 pm Post subject: Re: TC is the Answer! Well all I have to say is you must be one heck of a patient shopper to find such outrageously good deals, except for the flash and I think that is about the going rate right now. There was a time a few months back when Transcend was selling them for $17-$19. if I had known they were going to go back up I would of bought a few extra. And yes I can under stand using it in preference to your tower. I have a Dell XPS 720 tower and my T5710 will run circles around it for browsing and emil - heck for that matter even WEB videos. I did however go out and buy an ACER Netbook at Costco and it has now become my primary machine. And if you are interested it does get the five hours of battery life that they claim - I have a dell laptope that with a portable wind generator gets about 30-40 minutes on a charge. Needless to say I don't use it much anymore either. PS - your experience with your thin client is not unique, I think almost everyone that I have sold one to has immediately noticed and commented on the same thing - "Damn there fast". Good luck on your "Green" adventure. Prices are coming down on the 5700 and that is all you need. I bought a 5700 for $45 shipped just a month ago and I have installed a 10 gb HD in it. The HD was from my junkbox. The cable to install it was $3 on ebay. I have a full up version of XP running on it and will be adding a 6.5" TFT monitor to it for another $40, so for under $100 I have the complete system and its going into my car to run, among other things, MJ through a WiFi USB device ($15) to an antenna on the roof. WOW! Where can I get one for that price? Shouldn't be that hard to get one at that price off ebay. The challenge would be getting a touchscreen version for $40. Well Mr. stroths, long time since we posted in the same thread, too long actually. If you find a touch screen all setup not a screen that I have to put in a frame and find some bizarre obscure drivers and power supply for I would even go a tad-bit more than $40.